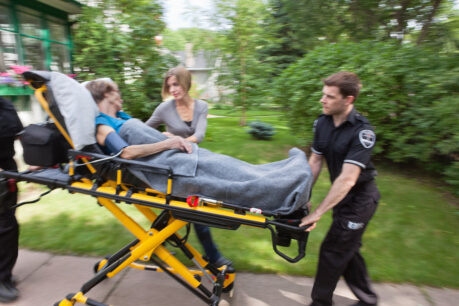 What Can You Expect from Emergency Medical Services? ← Do You Need Emergency Medical Services? You hear a thud and wake up in the middle of the night. You see your loved one in the corner of the room curled up in pain. Your first instinct would be to get them medical assistance and this is where our emergency medical services in Georgia can help. These services are designed to not only provide individuals a convenient way to get to medical facilities but also lifesaving emergency transportation. In an emergency situation, every single second will count. The moment you alert us, we will send our best straight to your location. It is our goal to be there within a few short minutes, regardless of where you are. This is ensures that you or your loved can receive crucial first-aid and quick transportation to the nearest medical facility. The first few minutes can make all the difference and this is where we operate at our best. We do not just send anyone when you call us. We send our best. Our EMS staff is a team of professionals with a lot of experience. They are not only talented drivers but also talented EMT’s. The moment they arrive at the scene, they will do their best to get you or your loved one in a stable condition, while transporting you to a reputable medical facility or hospital. They are quick, precise, and can save your life in an emergency situation. This is where our ambulance service in Atlanta shines. Depending on the emergency, we are able to deploy many different kinds of equipment. This equipment will ensure that we can administer proper care and get your loved one to the hospital safely, efficiently, and quickly. It can be tempting to take a loved one to the hospital yourself but unless you have no choice, it is better to get in touch with quality providers of emergency medical transportation in Atlanta, Georgia. This is because not only can we get your loved one to the hospital quickly but AmeriPro EMS can also administer aid at the same time. Share this blog to your friends and family because this information can save a life. This entry was posted in Emergency Medical Services and tagged Professional Assistance, Quick Response, Quick Transportation. Bookmark the permalink.